Manufacturing Engineering Education includes original and unpublished chapters that develop the applications of the manufacturing engineering education field. Chapters convey innovative research ideas that have a prodigious significance in the life of academics, engineers, researchers and professionals involved with manufacturing engineering. Today, the interest in this subject is shown in many prominent global institutes and universities, and the robust momentum of manufacturing has helped the U.S. economy continue to grow throughout 2014. 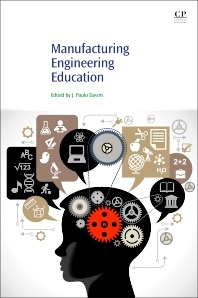 This book covers manufacturing engineering education, with a special emphasis on curriculum development, and didactic aspects. J. Paulo Davim received the Ph.D. degree in Mechanical Engineering in 1997, the M.Sc. degree in Mechanical Engineering (materials and manufacturing processes) in 1991, the Mechanical Engineering degree (5 years) in 1986, from the University of Porto (FEUP), the Aggregate title (Full Habilitation) from the University of Coimbra in 2005 and the D.Sc. from London Metropolitan University in 2013. He is Eur Ing by FEANI-Brussels and Senior Chartered Engineer by the Portuguese Institution of Engineers with a MBA and Specialist title in Engineering and Industrial Management. Currently, he is Professor at the Department of Mechanical Engineering of the University of Aveiro, Portugal. He has more than 30 years of teaching and research experience in Manufacturing, Materials and Mechanical Engineering with special emphasis in Machining & Tribology. He has also interest in Management & Industrial Engineering and Higher Education for Sustainability & Engineering Education. He has guided large numbers of postdoc, Ph.D. and masters students as well as coordinated & participated in several research projects. He has received several scientific awards. He has worked as evaluator of projects for international research agencies as well as examiner of Ph.D. thesis for many universities. He is the Editor in Chief of several international journals, Guest Editor of journals, books Editor, book Series Editor and Scientific Advisory for many international journals and conferences. Presently, he is an Editorial Board member of 25 international journals and acts as reviewer for more than 80 prestigious Web of Science journals. In addition, he has also published as editor (and co-editor) more than 100 books and as author (and co-author) more than 10 books, 80 book chapters and 400 articles in journals and conferences (more than 200 articles in journals indexed in Web of Science core collection/h-index 45+/6000+ citations and SCOPUS/h-index 52+/8000+ citations).